Behold, a dairy-free cheese recipe you might want to make often. Tastes authentic without making you feel bloated from dairy. Finally. It’s a spicy queso, with the main ingredient cauliflower, emulsified with cashew butter. Like most contemporary recipes my source calls for fresh. If you’re cooking the plant to death, why not use at-least-as-nutritious frozen? How pressure cooker cooks under pressure. Shown is a Fagor Splendid. Here’s the original recipe: Instant-Pot Vegan Cauliflower Queso of Epicurious.com. The Instant Pot is an electric pressure cooker, programmable with other functions such as a setting for Crock-Pot style slow cooking. I prefer a stove-top pressure cooker (Fagor currently). Conventional cooking instructions follow in the Notes. Place cauliflower, carrot and water into pressure cooker. Bring to pressure and cook 5 minutes. Use the quick method to release pressure. Add the nut butter. Puree thoroughly with an immersion blender, food processor or jar blender. Return the vegetable puree to the pot, off the heat source. Stir in remaining ingredients. Taste and adjust seasonings, such as more salt or more spicy heat. Simmer gently, uncovered, 5-15 minutes to reduce to thickness desired. Makes about 4 cups. Serve as cheese sauce or dip, warm or room temperature — it won’t congeal like dairy cheese. Keeps a week or two covered, refrigerated, then stir and perhaps warm before serving. Frozen cauliflower generally comes in 12 oz. bags, so this is 2/3 of a package. Using the whole package is fine. The carrot is there for color and texture. As it is naturally sweet, use this amount or a bit less, or the dip will be too sugary. 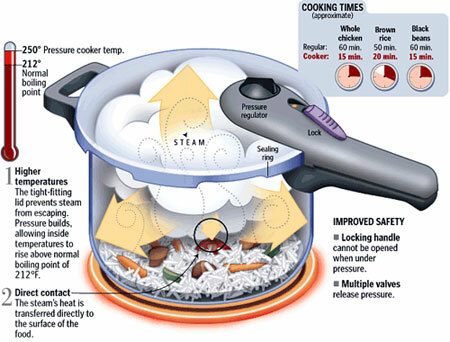 A pressure cooker is not necessary. Simmer the two vegetables in the water in a saucepan, covered, for perhaps 20 minutes, checking occasionally to add a little water to prevent burning. Or, combine the cauliflower and carrots with 1/2 cup water in a 4 cup microwave-safe bowl, cover loosely so steam can vent and microwave 5-7 minutes, stopping to stir once or twice. When cooked to tenderness, the mix should mash easily with a spoon or fork. But mashing isn’t enough as emulsifying the first four ingredients creates the cheese like consistency. Cashew butter (in stores near peanut butter) has a good neutral flavor, yet any nut better is fine except peanut butter. That’s a bizarre pad thai sauce so no. Almond butter works well. The oil naturally in nut butters helps the cheese mouth-feel. Nutritional yeast enhances flavor something like Parmesan cheese does, a great vegan pantry staple, found online or health food stores. I’m calling for dried onion and garlic (flakes or granules etc. preferably not powder) as they’ll help thicken the queso. Consider who’s eating like those with sensitive tummies or kids when considering the peppery elements — and that you truly can’t undo too much spicy heat. I prefer Rotel mild over original for those reasons. You might want to wait to the taste-checking step before adding chili, chipotle or red pepper and then pinch by pinch. Vegan burgers, vegan versions of anything in the meat-centric world usually won’t fool conventional diners. Having fake meat or dairy is a tricky part of the animal-free cuisine. Now that I’ve been off four-foot anything and chicken embryos for six years come April — 95 percent of the time — analogs strike me as missing the point. Still, store-bought (check ingredients as some top brands have dairy or egg) or homemade burgers (best is this recipe of Mark Bittman) with some easy side like a salad or a side of broc, green beans etc. is our quickest home dinner. I miss cheese the most. It usually grabs my 5 percent cheat allowance. Well-stocked groceries have some fine vegan cheeses (Kite Hill and Miyoko), which are expensive, while popular ones (Daiya) don’t quite hit me. Homemade cheeses are fun, with recipes usually requiring soaked cashews, whirled in a blender., which has to be top-grade to eliminate graininess. One question I’ve been searching online for a long time is, Why not scoop out a few spoons of cashew butter instead of grinding your own? I’ve found only a couple of such recipes and no explanations. The lowest model of Vitamix, considered the top blender, is $300. House brand (say Walmart’s Sam’s Choice) cashew butter is $5 for a 12 oz. jar. It’d take 60 of those before the Vitamix got paid for. The recipe above proves my point, cashew butter is convenient and equivalent. I avoid using the phrase “plant-based,” the new vegan synonym. A regular hot dog loaded with, say, kraut or slaw, mustard and ketchup, and on a wheat bun, being mostly veg would be plant-based, right?